Yesterday marked the 8-year-anniversary of the death of young Russian priest, Fr Daniel Sysoev (1974-2009). The priest was truly a towering figure in the Russian church, a talented, popular theologian, author, and evangelist. He was very active as a missionary in his native Moscow, especially among the Muslims, neo-pagan, and sectarian population of the city. He engaged with Muslims in multiple public debates (at their request) and was able to convert scores of them from Islam to Orthodoxy. At age 34, he was murdered in his church by a Muslim fanatic. His death shook Orthodox Christians all over the world. Below, you will find a fantastic compilation of reminiscences about him from his closest friends and family, which give insight into the life--and death--of this extraordinary man. It was written by Archimandrite Melchisedek (Artiukhin) for Ortho Christian. 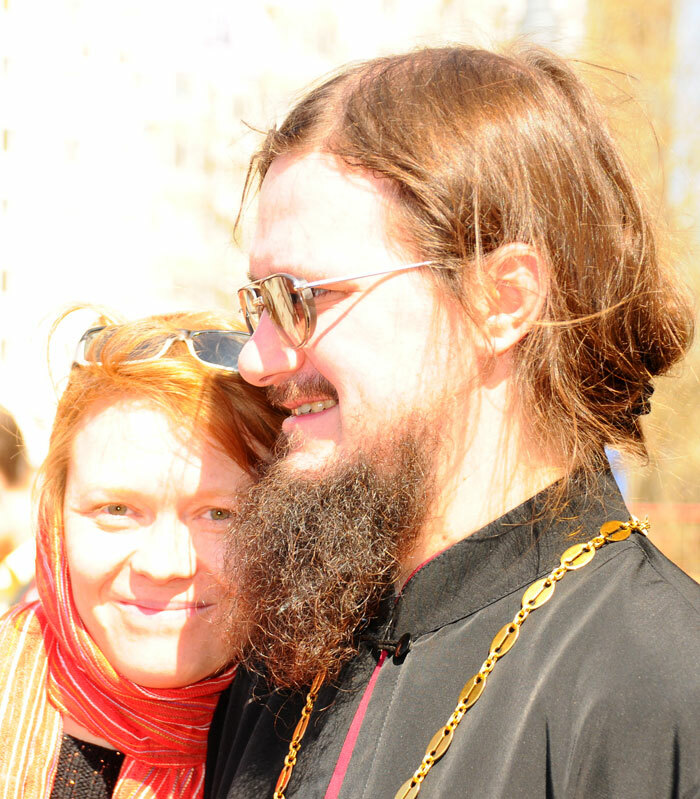 A priest once wrote these words in his last book: “The best end, which only a Christian can imagine, is a martyric death.” These words were written by the murdered priest Daniel Sysoev. St. John Chrysostom once said, “It is not only death that makes martyrs, but the whole dispensation of life.” But the whole dispensation of life. Fr. Daniel’s mother, Matushka Anna, said, “He grew up a very weak boy, and was near death three times, not distinguished by such a fighting nature as he later had, when he became a priest. He was a very bookish person, always reading books, which led to him needing glasses. Then he went to school. Remember, he was born in ’74; it was ’81 when he was seven—the peak of Soviet life. He missed the beginning of class in September in second grade. His homeroom teacher came to our house and suddenly saw a circle of icons. She was in shock. She told the headmaster, she talked about it at the teachers’ meeting, and they began to brainwash him, overloading him with books from the library. His physics teacher even brought some kind of device to our house (maybe you remember from when you studied), which produced lightning, saying, ‘Look, son, it’s not God in Heaven, and it’s not the prophet Elijah making the lightning—there’s no miracle here—it’s just this device.’ And nothing helped. I remember, his classmate that he lived with in the same cell for four years at the Holy Trinity-St. Sergius Lavra, said, “He didn’t listen to the teacher in class. He would read books. He was surrounded by books. He received death threats fourteen times. The church where Fr. Daniel served was small. When his murderer entered the church, there’s some stairs to the second floor there just inside the door, that the regent, Vladimir Strelbitsky came down. The killer saw his cassock and shot the regent, wounding him in the shoulder, and two women who were there cried out. Fr. Daniel, in the altar, preparing to hear someone’s confession, must have heard this shot, or the women’s cries. And when the murderer yelled out, “Where is Sysoev?! Where is Sysoev? !” it was impossible not to hear it. He was wounded in the neck, in the carotid artery, and when he fell to the floor, he was fatally shot in the back of the head, and the bullet went through, right through, into the floor of the church. He had a choice. He could have sat it out in the altar, or hidden, escaping through the attic. He didn’t do that. When we read from the Old Testament on the day of the repose of a martyr, we read these words: He, being made perfect in a short time, fulfilled a long time (Wis. 4:13). It’s possible to live a long time and do nothing for God, for man, or for the Church. And it’s possible to live a short life, but when it’s with God it will be a long life before God, despite the fact that the number of years is not so large. Not long before his death he told his daughter, “When they kill me, don’t cry for me, but pray for me.” We know that when we pray for sinful people, the Lord hears our prayers and gives them His merciful aid and strength. When we pray for the righteous, this prayer returns to us—our love returns to us. We have gained a martyr in Heaven, a confessor of Christ, and an intercessor before God for us sinners. Eternal and blessed memory to the ever-memorable murdered Priest Daniel!! !